Today we have YA author (and fellow NLA writer) Miranda Kenneally here to chat with us about making your writing sing, and the little things you can do to make a big difference. Her novel CATCHING JORDAN is another one generating a lot of buzz out there, so check it out. I was a huge fan of the old Zanballer books when I was a kid, so this one is going on my holiday list for sure. 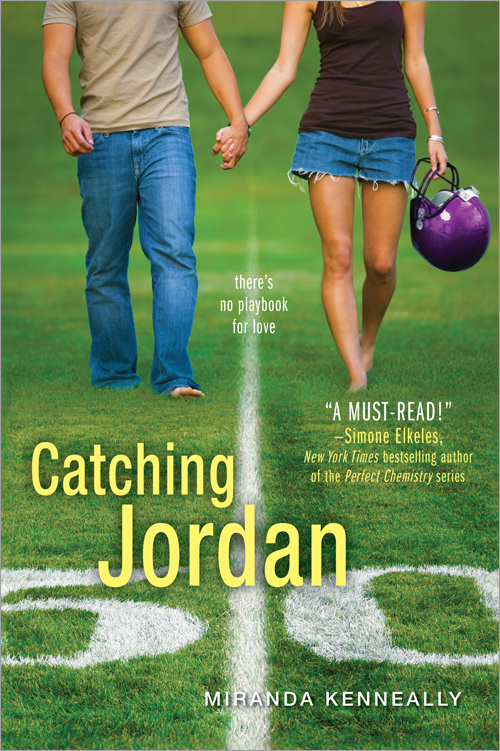 Miranda is the author of CATCHING JORDAN, a contemporary YA novel about football and femininity, coming in December 2011. Other books include THE GIRL I USED TO BE (fall 2012) and BAD, BAD THING (spring 2013). Miranda is the co-creator of Dear Teen Me. The Dear Teen Me Anthology will be published by Zest Books (distributed by Houghton Mifflin Harcourt) in late 2012. She enjoys reading and writing young adult literature, and loves Star Trek, music, sports, Mexican food, Twitter, coffee, and her husband. Follow her on Twitter or Facebook. Miranda is represented by Sara Megibow at Nelson Literary Agency. Every author has a thought process for writing. Mine is to think of books like songs. Every book is a song. It has a rhythm. It tells a story. It evokes feelings. Sometimes you hate a book. Sometimes you love it. It was another boring day at the bank. A man stepped up to the teller window, which was smudged with fingerprints. The man was wearing a bowler hat and his mustache twitched. He gave me a smile, as he leaned forward to whisper into the microphone. “Give me all your money,” he said. He held up a gun. I held up my hands. I leaned back in my seat. Opened the drawer. Pulled out the money. Shoved it through the hole at the bottom of the window. Bit into my lip. Tried not to scream. The man grabbed the pile of cash and ran out of the bank. I let out a long breath, and frantically pushed the panic button, calling for security, and eventually the police. If I had written the preceding passage like this example below, would you, as a reader, have felt the same urgency? He held up a gun, and I held up my hands, rolling back in my seat to open my drawer. I pulled out the money and shoved it through the hole at the bottom of the window. I bit my lip and tried not to scream when the man grabbed the pile of cash and ran out of the bank. Try reading aloud to see if you’ve got rhythm. I put a piece of meat in my mouth. I popped a chunk of chicken in my mouth. He weaved a hand through my hair. When listening to lyrics of a song, you should grow more invested in the song’s story verse by verse. To get your readers caring about what happens to your main character, you need to set the stage by explaining what is most important to them. Say your main character has worked for years to become valedictorian, and your book is taking place in that crucial last semester of high school. You should spend a few pages setting the stage, showing your character studying and acing tests and planning his valedictory speech. Then, in order to have an inciting incident (every book needs one), you need to totally rock your main character’s world. What if the main character’s parents die, leaving him questioning everything. Is being valedictorian really all that important if you have no one to share it with? That’s basically the plot of WATER FOR ELEPHANTS. The main character is going to become a vet, but when his parents die, he’s forced to join the circus in order to survive. How did the author up the stakes and make the story even more emotional for the reader? The author gave the circus financial problems, scaring the main character even more. Keep throwing more and more realistic obstacles at your character. This will not only make your story more exciting and engaging, it will help your character to evolve over time. Also, your readers will become increasingly invested as there is more and more for them to root for. And finally, like a song, books should use as few words as possible to get points across. What techniques do you use when writing?When editing, can you see/feel a rhythm in your writing? Do you check to make sure you’re using the most specific words? Are you continually testing your main character in every way possible? Personally, the first example you gave on rhythm is a bit too simplistic, but I see your point. Great post! Lots of good things to think about here, and I loved your examples. I just wrote my review of Catching Jordan on goodreads. . .I had intended to read a chapter or two of it, and ended up staying up all night reading it :-) Loved it, and can't wait for your other books to come out. Congrats!